A BUBBLING CAULDRON: Kent Treptow's "City of Lost Children"
Shifting gears from the simmering political stuff for just a little bit, I want to draw your attention to the absolutely wonderful series presented in our local newspaper of record, the Daily Pilot, by photojournalist Kent Treptow. 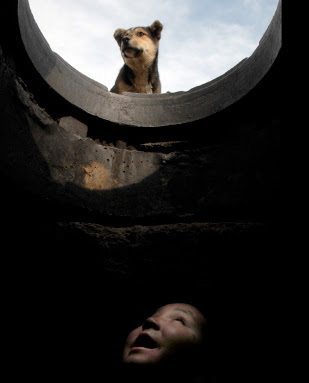 Kent made a couple trips to Mongolia a few months ago and returned with a wonderful, yet painful, story entitled "City of Lost Children", which provides a poignant account of children he encountered who live in manholes below the city streets of Ulaanbaatar, Mongolia's capital city. You can find this very moving story HERE. Once there, bookmark it for easy return to the site - you'll be glad you did. Please take some time to read the text and view the narrated slide shows. Doing so will change your lives. The next time one of your kids complains about being asked to take the trash out, or whines about not having enough cell minutes to fully participate in the texting confab being conducted by their friends, plunk them down in front of your computer, click on the link to this story and tell them to view Kent's slide shows. Congratulations to Kent Treptow on an outstanding piece of photojournalism, and to the editors of the Daily Pilot for publishing it. It is rare, indeed, to find such an outstanding piece of work in any community newspaper, but the readers of the Daily Pilot have come to expect such excellence. Let's hope they continue to raise the bar despite the turmoil swirling around them in the post-acquisition chaos created by Sam Zell and his mindless mercenary minions. I enjoyed your little blog thing there, very nice indeed! Thanks... I appreciate all comments and I'm sure my friend, Kent, will appreciate it, too. In the interest of full disclosure, though, I must tell you that it's produced on a Mac... sorry about that. If that is Steve Ballmer, I'm Bill Clinton. Kent Morrow, Duh! I feel your pain! :-) Follow his link - it's a great parody! Kent...you mean you are NOT Bill Clinton? !